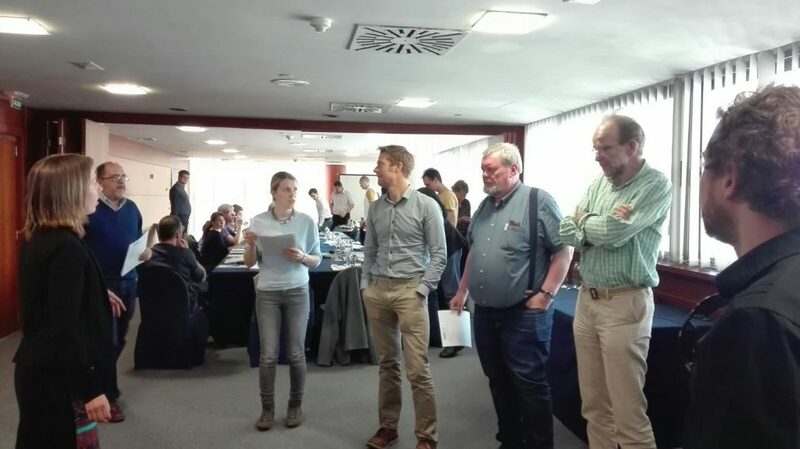 The European Federation Geologists organized an orientation workshop for the National Associations (Linked Third Parties), involved in CHPM2030 project. 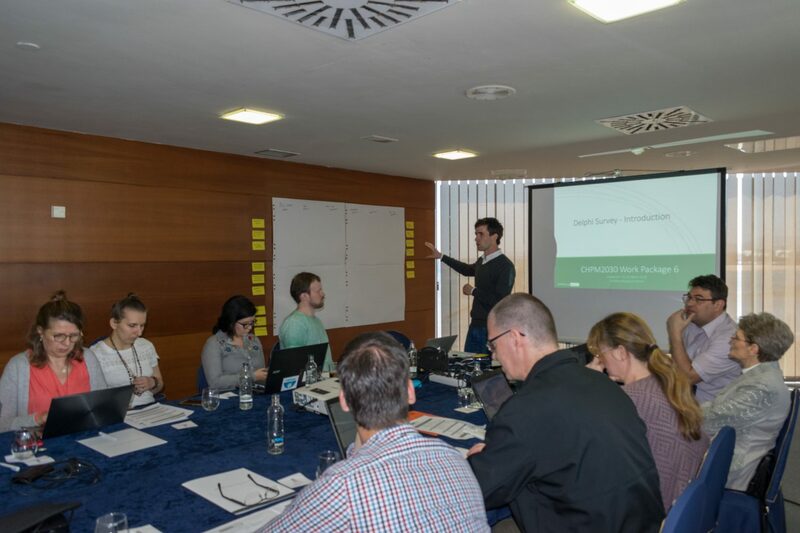 The workshop was connected with WP6 – Roadmapping and Preparation for Pilots, managed by La Palma Research Centre. Earlier in the project, the LTPs were involved in data availability, and now in WP6 the focus shifts to data evaluation. 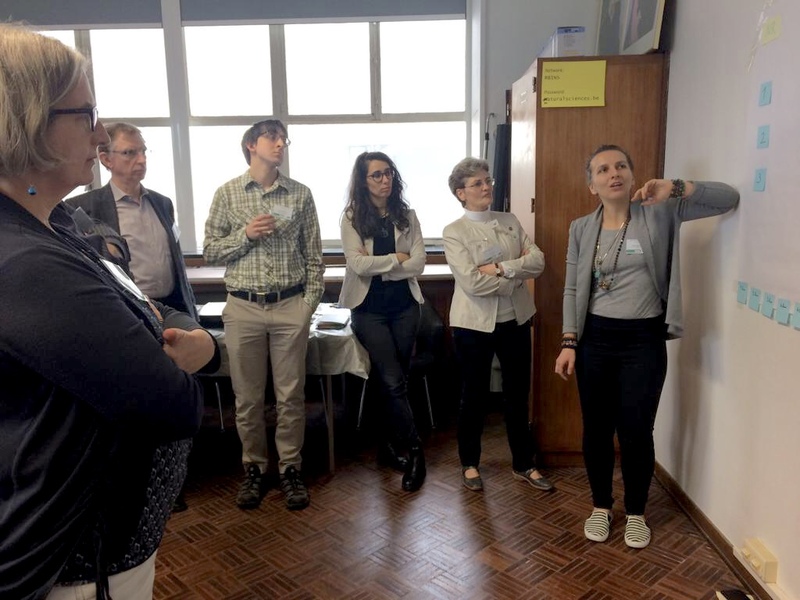 The aim of the event was to update the LTPs about the recent development of the project and to create guidelines and instructions for CHPM prospective areas selection & evaluation. 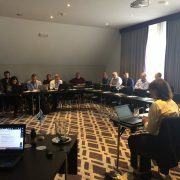 The workshop started with a welcome and opening from Isabel Fernandez (EFG), followed by Éva Hartai’s (UNIM) presentation about the the project as a whole at its latest development stage. 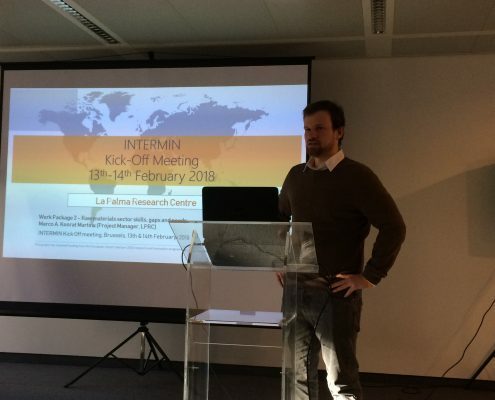 The next talk, by Gerhard Schwarz (SGU), presented the data availability and summary of country reports, that has been done earlier in the project. 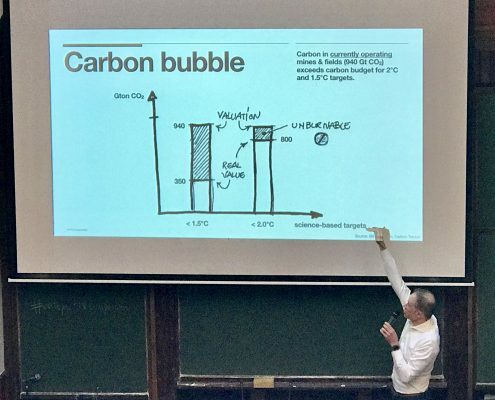 Tamas Madarasz (UNIM), then explained the details of the CHPM technology building blocks: underground heat exchanger, production pump, metal recovery at high pressure/temperature), surface heat exchanger in the geothermal power plant, gas diffusion electro-precipitation metal recovery, salt gradient power generation, injection well. 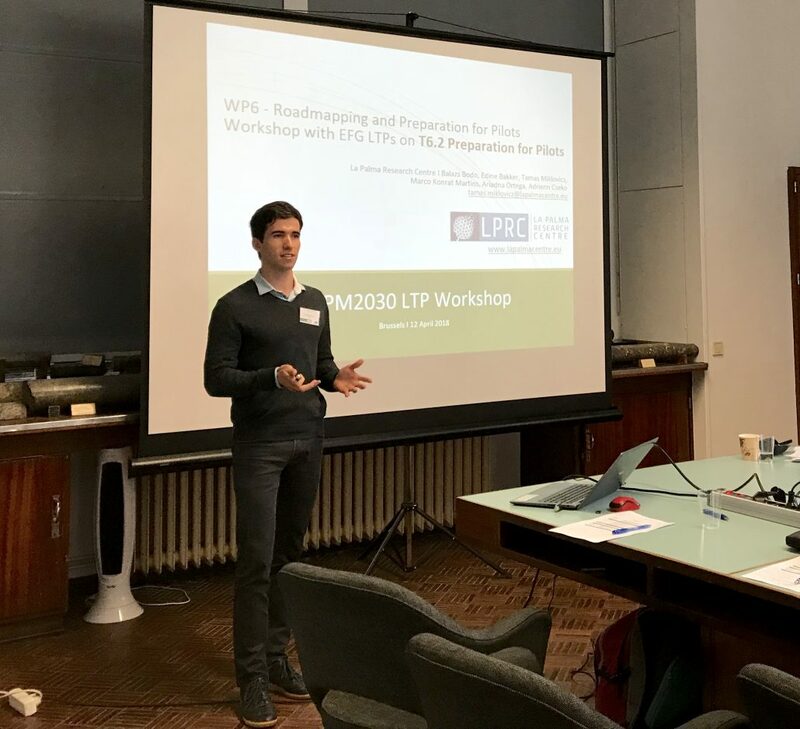 The next presentation, by Tamas Miklovicz (LPRC), introduced the overall picture at WP6 level, and explained objectives for the study area evaluation. 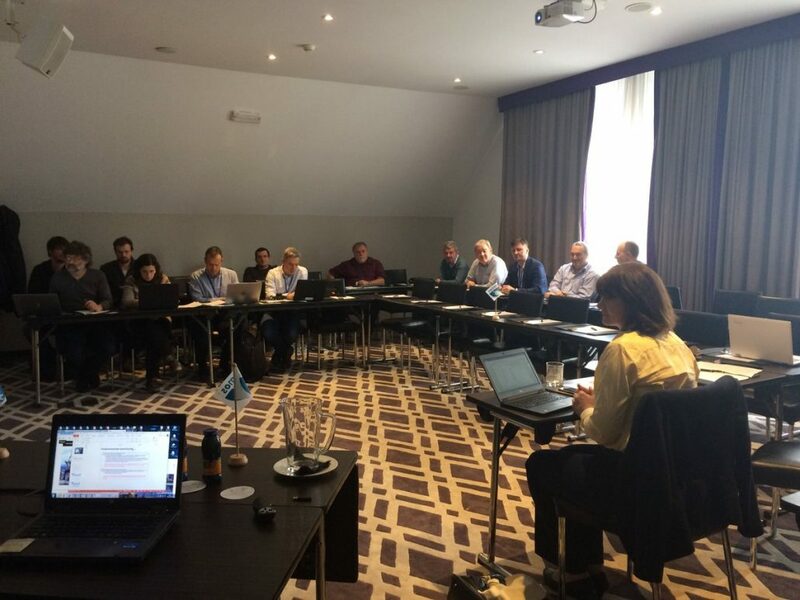 Before the workshop, Anita Demény, from EFG, further detailed the objective of the LTP efforts. The workshop was divided in two parts: area selection and area evaluation for CHPM technology application. 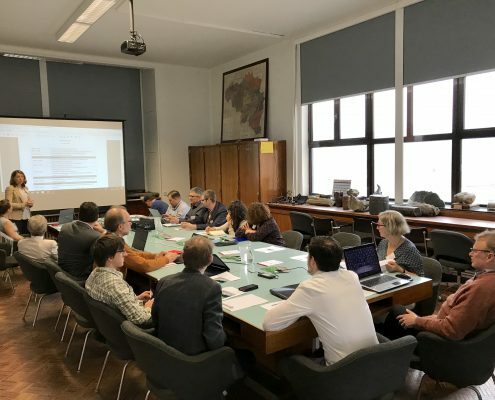 The first part was an example-led discussion, while considering different geological cases and deciding whether it was of interest for the project or not. 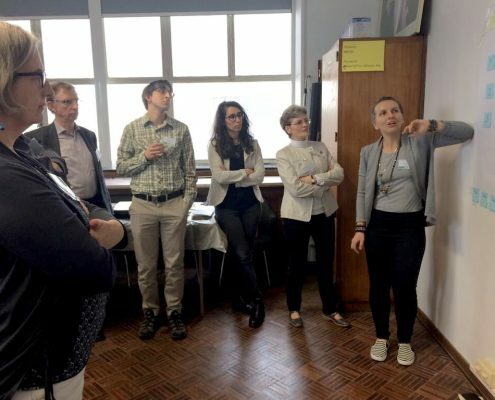 The second part was dedicated to develop and elaborate an a harmonised framework, that will guide a possible study area evaluation for CHPM potential. 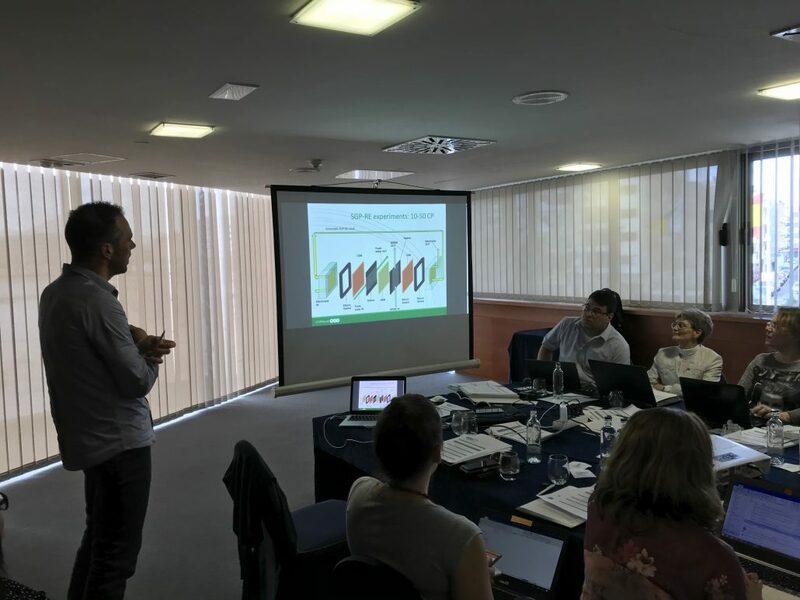 The workshop was very successful in both updating the LTPs on the latest CHPM technology development and on gathering ideas and adjusting the framework for study areas’ evaluation. 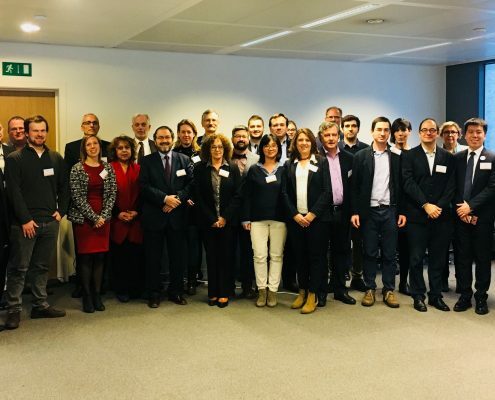 During 2018, the LTPs will be selecting and evaluating areas in Europe, where the CHPM technology could be applied in the future, thus creating an EU spatial database for prospective locations. 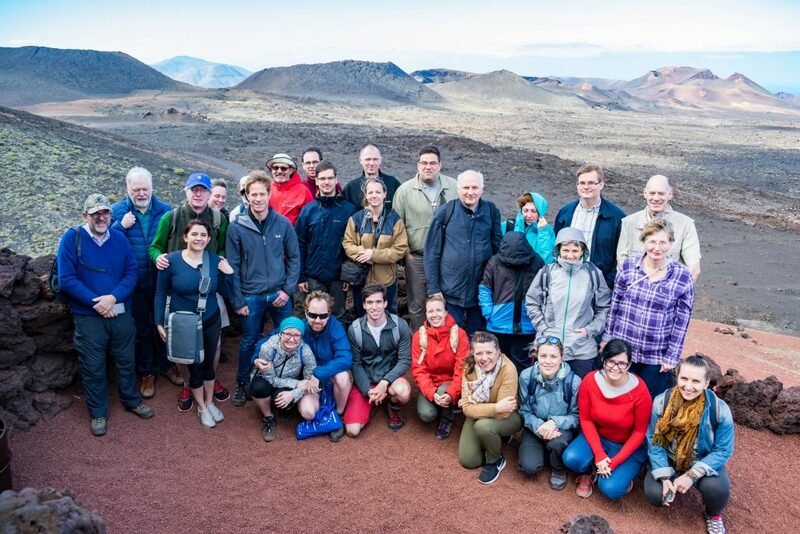 The CHPM2030 5th Consortium meeting took place in Lanzarote, Canary Islands, between the 21st and 23rd of March, hosted by La Palma Research Centre. 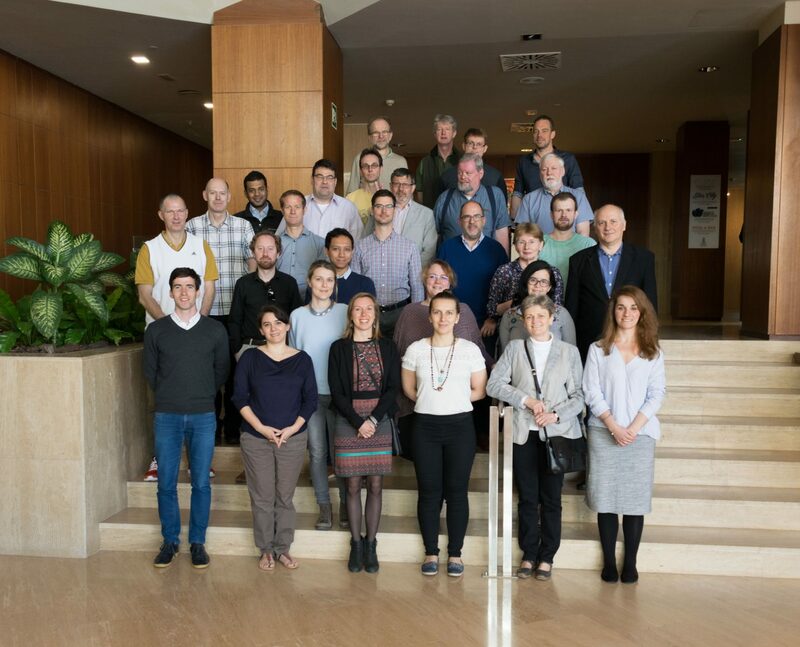 The meeting started with a one-day consortium meeting, followed by workshops on WP4 – System Integration and on WP6 – Roadmapping and preparation for pilots on the second day. 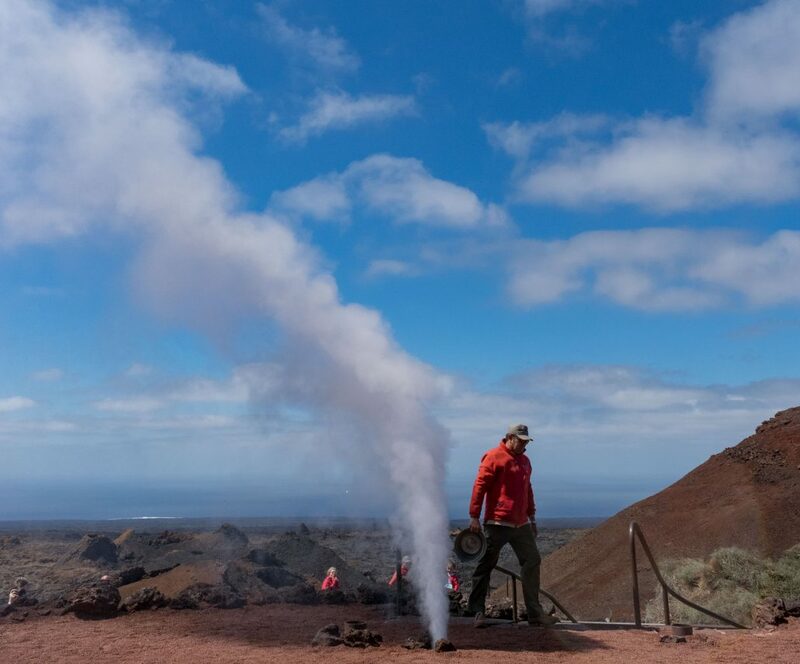 During the last day, the participants joined to a field trip in the Timanfaya National Park. 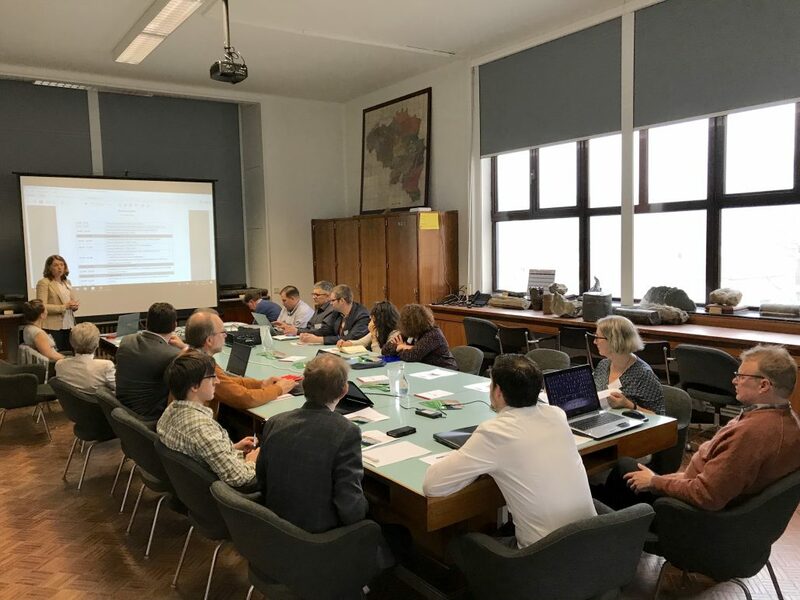 The consortium meeting proceed according to the common practice: going through the each of the Work Packages, updating work done and new results since the last meeting (CHPM Brusels meeting, 2017.10.11-14). 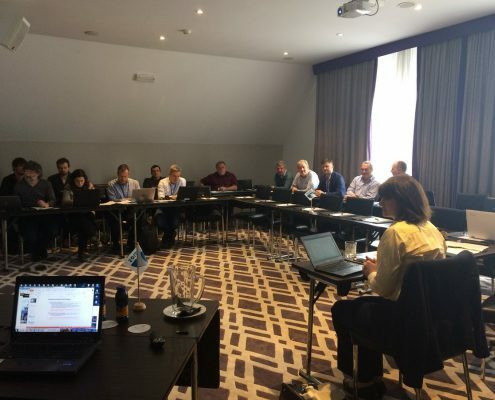 After a short welcoming of the participants and meeting practicalities from LPRC, Éva Hartai officially started the meeting with an overall project update, followed by a presentation from Aranka Földessy about preparations for the project reporting. 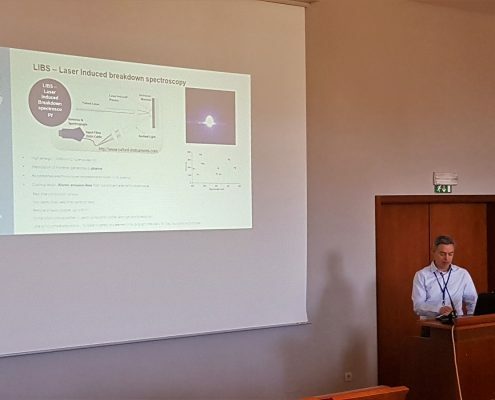 The second session continued with presentations on WP2 – Laboratory experiments and orebody investigation by partners from University of Szeged, BGS, VITO and University of Miskolc. 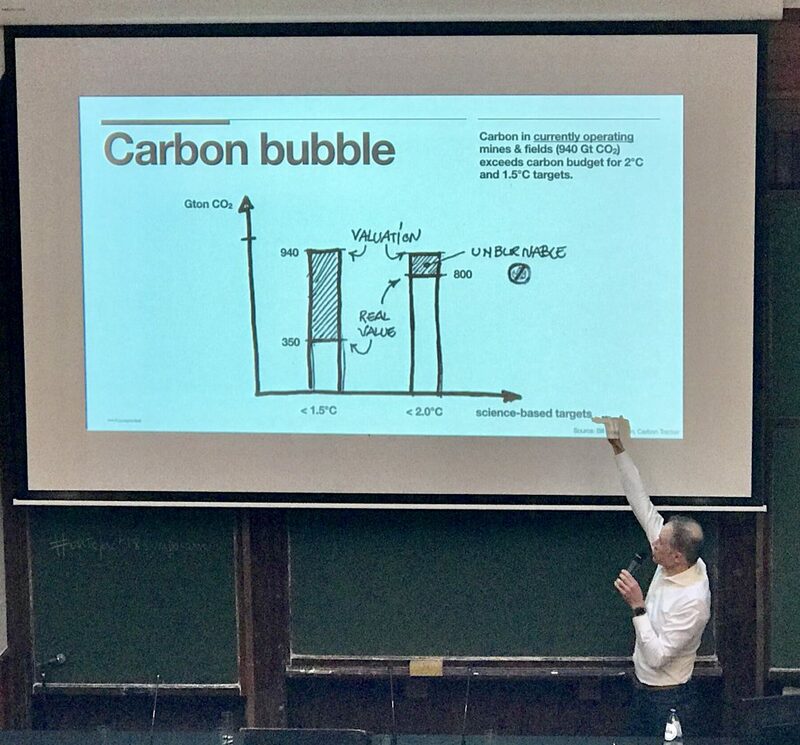 The next session in the afternoon presented progress in WP3 – Metal recovery and electrochemical power generation by VITO and KU Leuven colleagues. 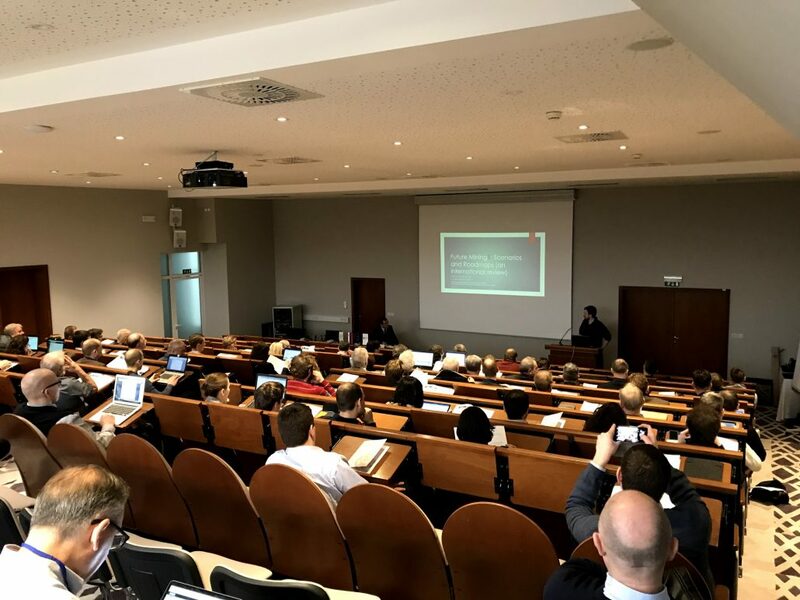 The first day also included an update on WP5 – Integrated Sustainability Assessment (University of Szeged and MinPol) and WP7 – Dissemination (EFG). The second day brought something new to the meeting. 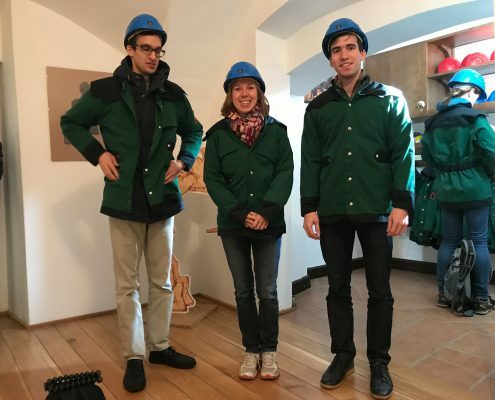 The WP leaders decided to take a more interactive approach to introduce their work. 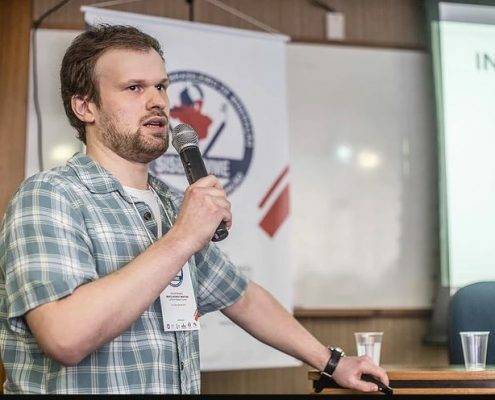 The morning session was dedicated to WP4 – System integration, and it was moderated by the respective WP leader, Árni Ragnarsson (ISOR). 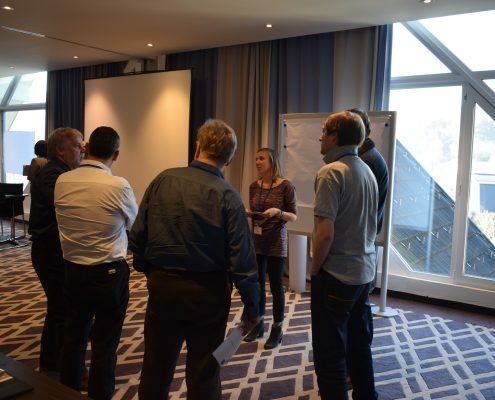 This is a critical work package where the partners integrate and harmonize different elements of the system together. 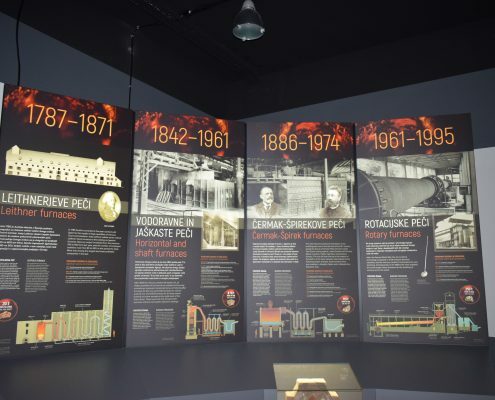 The discussed topics included: Conceptual framework for CHPM (Combined Heat Power and Metal extraction) power plant, Process simulation and optimisation, Process simulation and optimisation, Final design process. 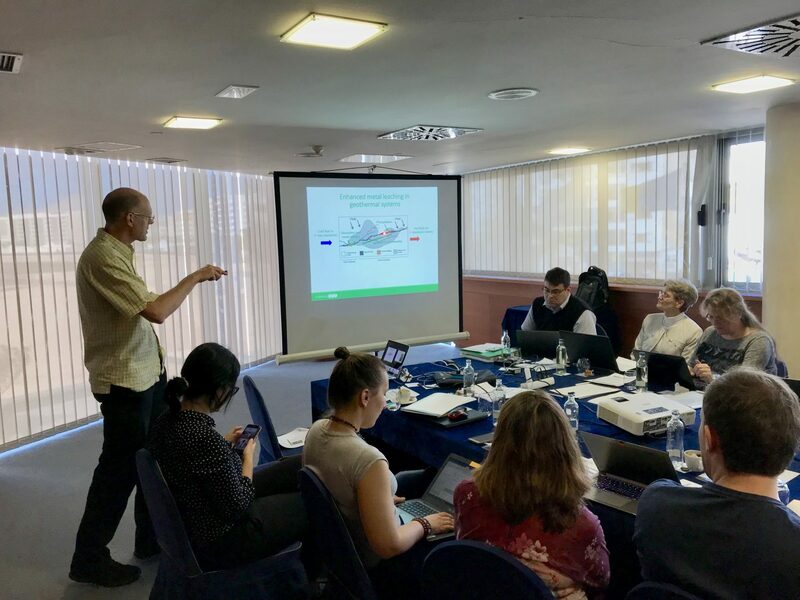 The afternoon workshop was organized by La Palma Research Centre and was focused on WP6 – Roadmapping and Preparation for Pilots. 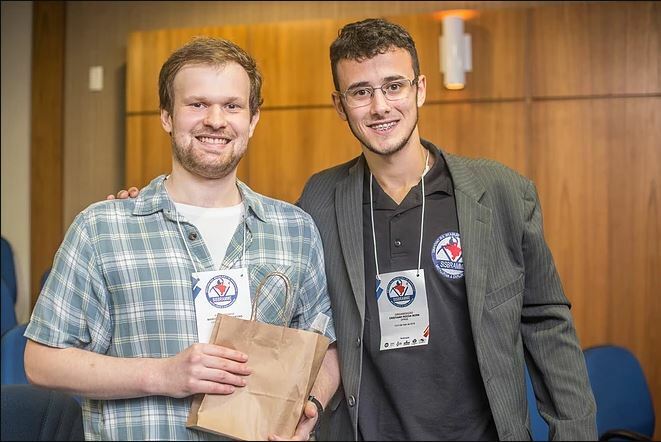 This work package is setting the ground for subsequent CHPM technology implementation in the future. Therefore, it maps convergent technology areas, studies pilot areas and develops research roadmaps, in order to bring the realization of CHPM technology forward in time. This requires short-term planning (including pilot preparation) and long-term planning (including a Delphi survey). 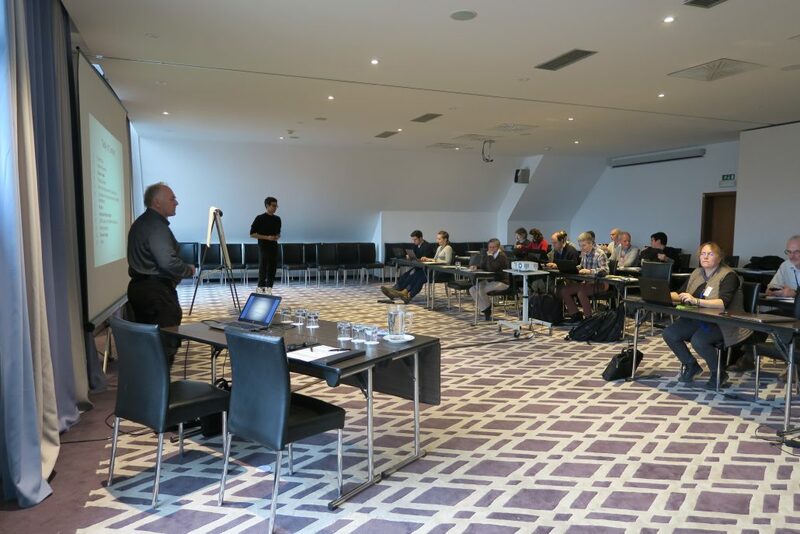 The first WP6 workshop was dedicated to the long-term planning and the development of a CHPM2030 Delphi survey. Marco Konrat (LPRC) introduced the Delphi method, which will be used later to obtain experts’ opinions on the critical interest areas in CHPM technology. 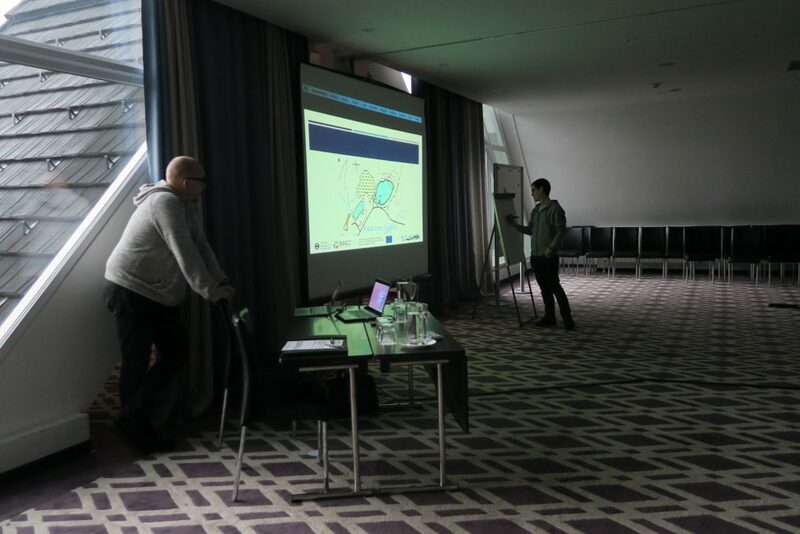 Marco explained that Delphi is a long-term foresight tool to make judgements in the face of uncertainty, expert knowledge based, containing 2 rounds of an iterative process, and that it will assess the long term (2050) applications of CHPM technology. 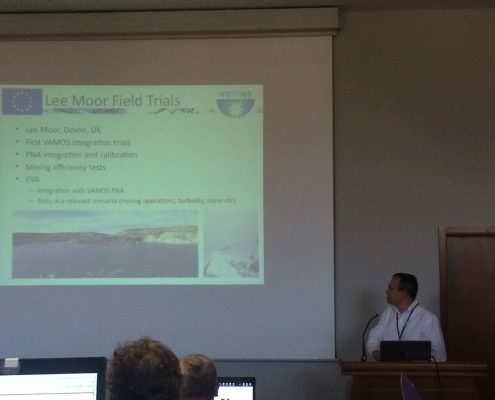 After this, Tamas Miklovicz (LPRC) presented Task 6.1 – Horizon Scanning and Visions objectives, structure and methodology for the CHPM2030 Delphi survey. 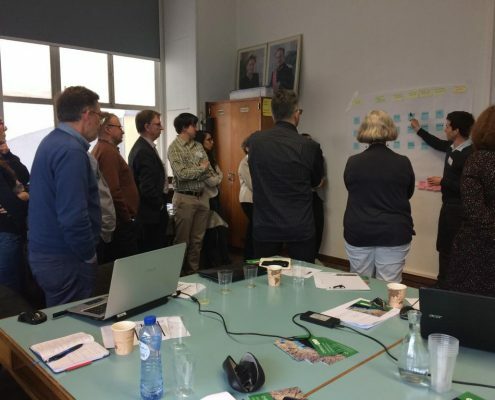 Within this subtask, Horizon Scanning will present a baseline for CHPM technology in 2018, the Delphi will assess the future of the technology, the established Vision (Visioning workshop later this year) will provide a goal to arrive by 2030/2050 and the Roadmaps will set the implementation of how to arrive to the desired vision. 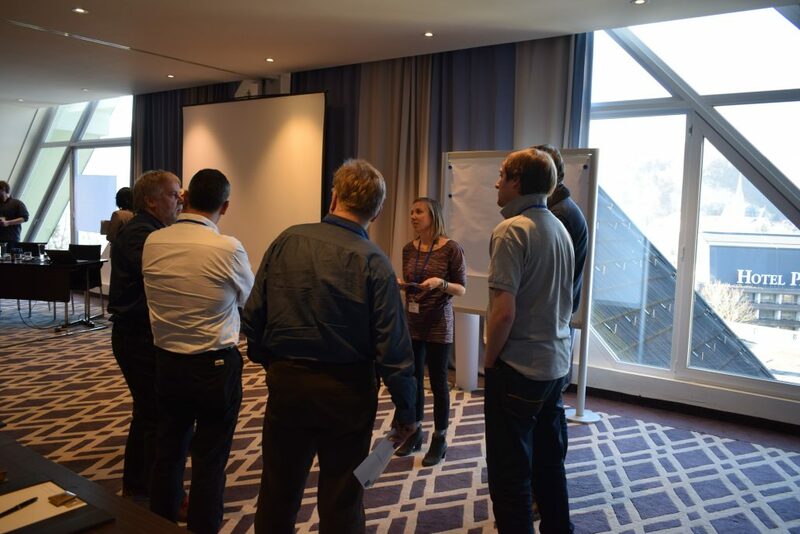 The workshop participants were given the task to first map key interest areas (important for CHPM technology), identify gaps (which is important but uncertain) and nominate concrete issues within the gaps that we are interested in the experts’ opinion. The second workshop was dedicated to the evaluation of the study areas. Within this subtask all efforts will be made towards the support of the first implementation of CHPM technology. 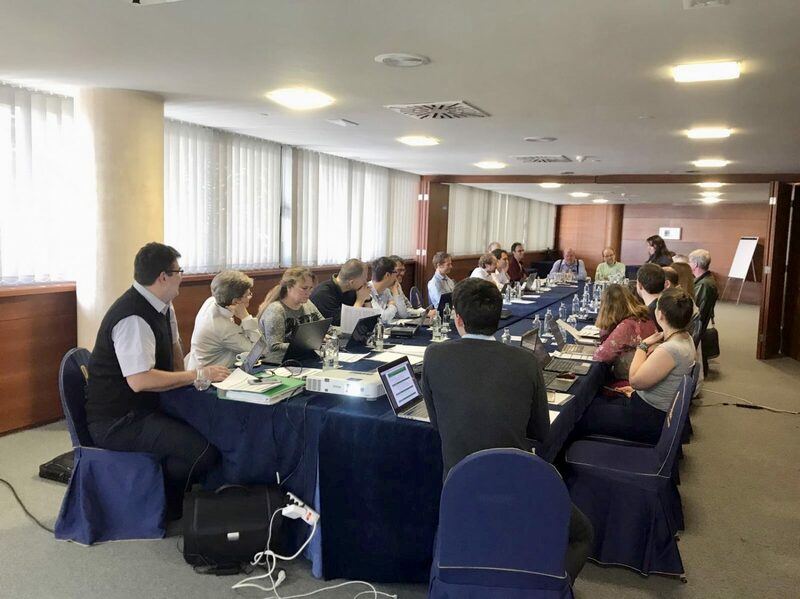 In particular, the focus will be on four areas, represented by BGS (UK), SGU (Sweden), IGR (Romania), and LNEG (Portugal), beside an European Outlook of prospective CHPM location, with the help of EFG LTPs (Linked Third Parties). In WP1 the main objective was to survey data availability on these areas. In WP6 the effort shifts to data evaluation. 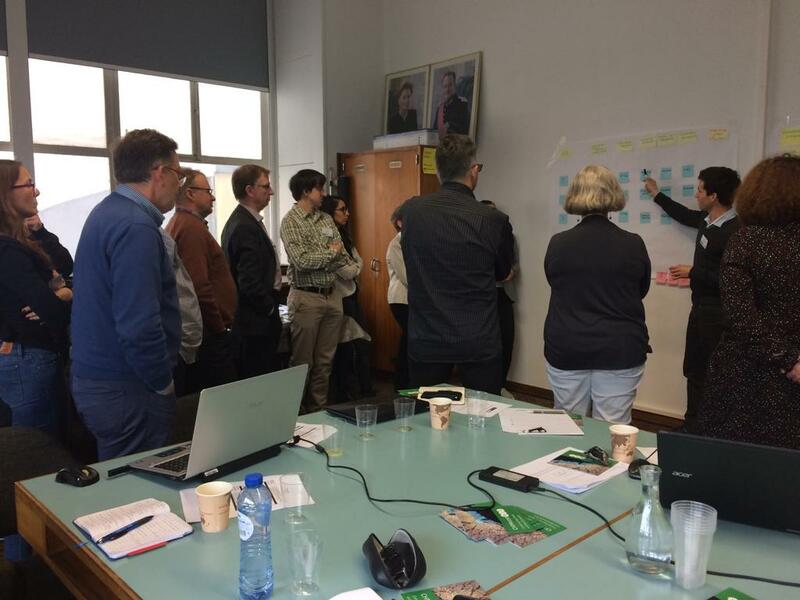 In order to create a consistent assessment of each site, an evaluation framework has to be set up, which was the aim of this session. 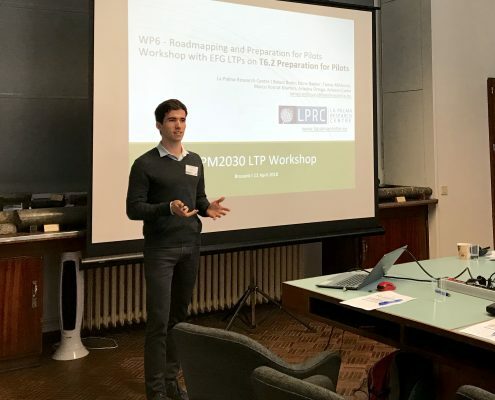 Anita Demény presented an update on the LTP work, summarising WP1 results and introducing WP6 planning. After the introduction, the study area representatives presented their plans to evaluate each study area. This was followed by the workshop. 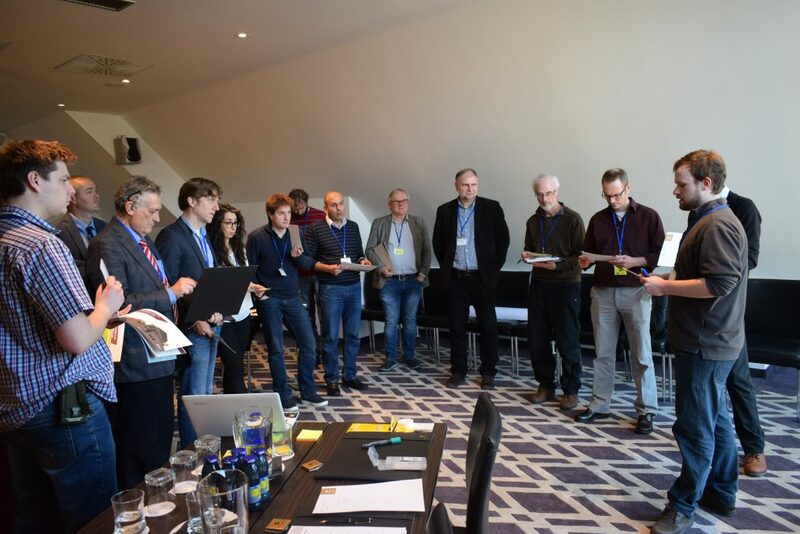 The goal of the exercise was to get the technology developers and study area representatives into a dialogue and discuss what a study area evaluation shall include. 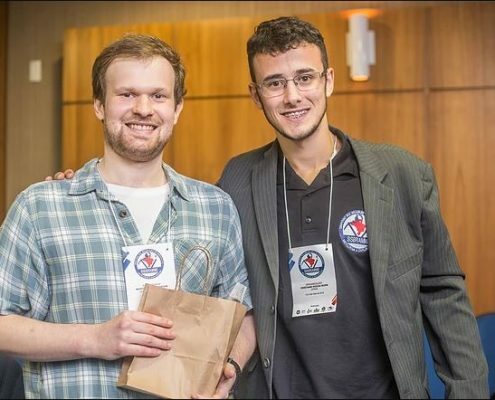 The technology developers presented requirements, while the study area representatives presented availability at their sites, in a matchmaking exercise. 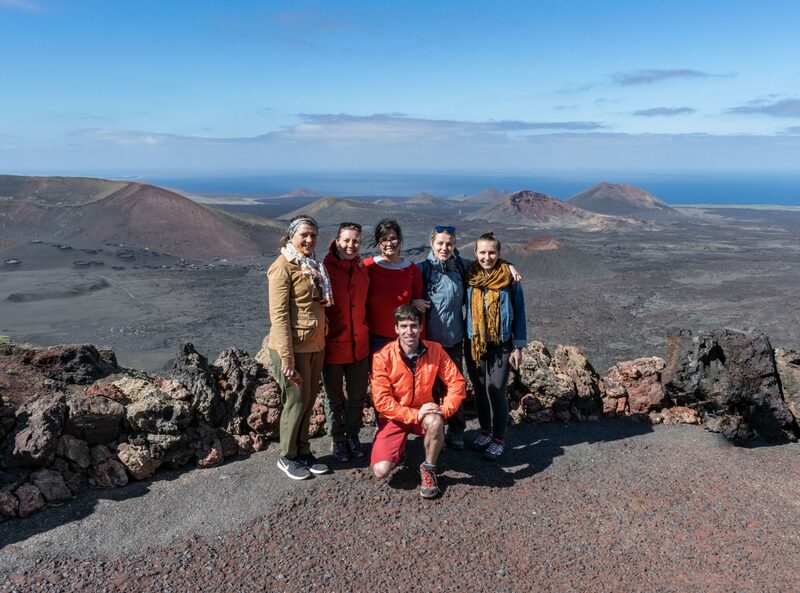 The CHPM2030 Lanzarote meeting closed with a field trip to Timanfaya National Park, where the partners had a guided tour and learned about the formation and volcanic structures of the park. 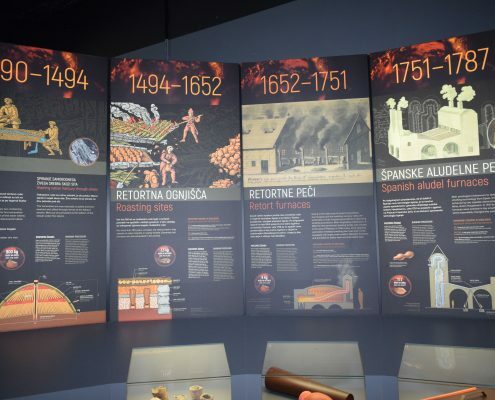 The eruption started in 1730 and lasted for 6 years – with 100 active volcanoes covering 50 km2! 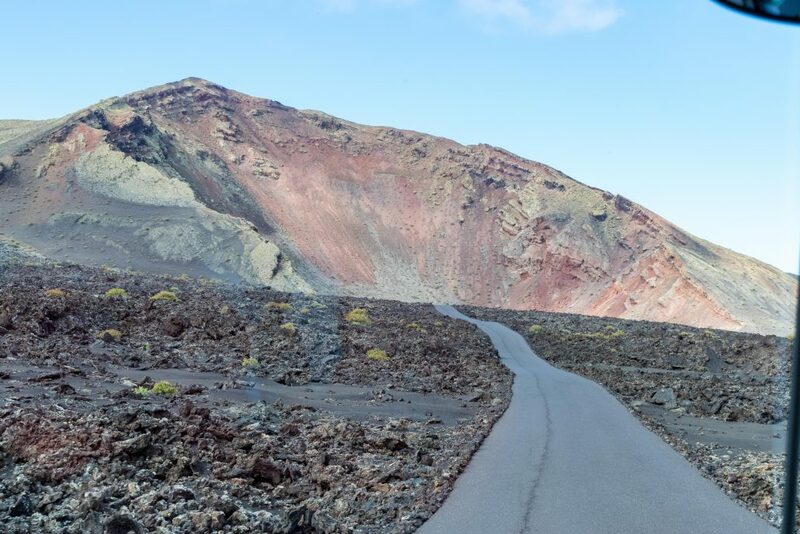 Even though the eruption was almost 3 centuries ago, the volcanic rocks are fresh, due to the arid climate and therefore the lack of chemical/physical weathering. 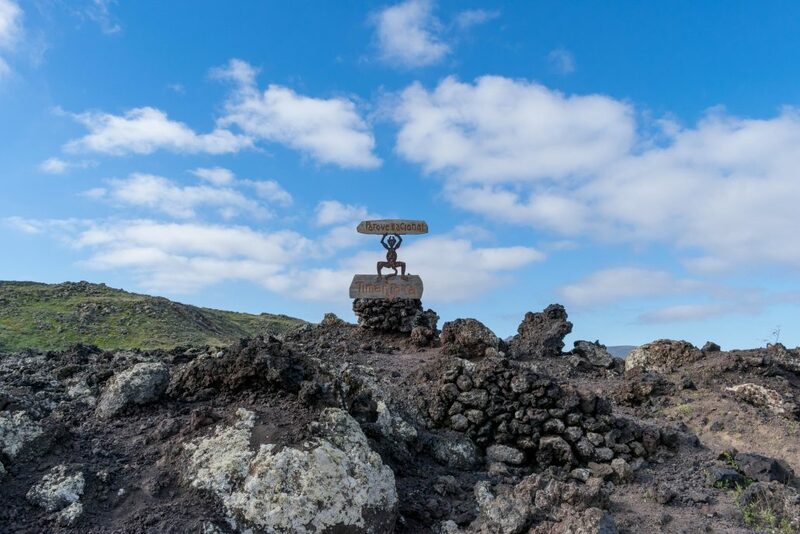 This makes them the perfect place for a geological lesson! 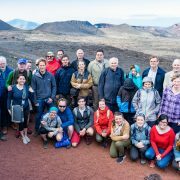 The CHPM2030 Consortium gathers again in Iceland later this year! 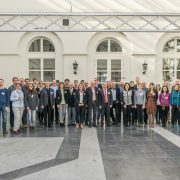 Over the past 3 years the La Palma Research has been part of KINDRA project, aimed to gather and standardise groundwater knowledge and research across Europe by means of a EU-wide assessment of existing groundwater-related practical and scientific knowledge based on a new Hydrogeological Research Classification System (HRC-SYS), created by the project team. 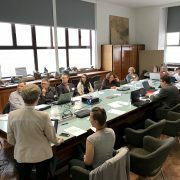 This classification is supported by a web-service – the European Inventory of Groundwater Research (EIGR) –acting not only as a knowledge repository but also as a tool to help identify relevant research topics, existing research trends and critical research challenges. 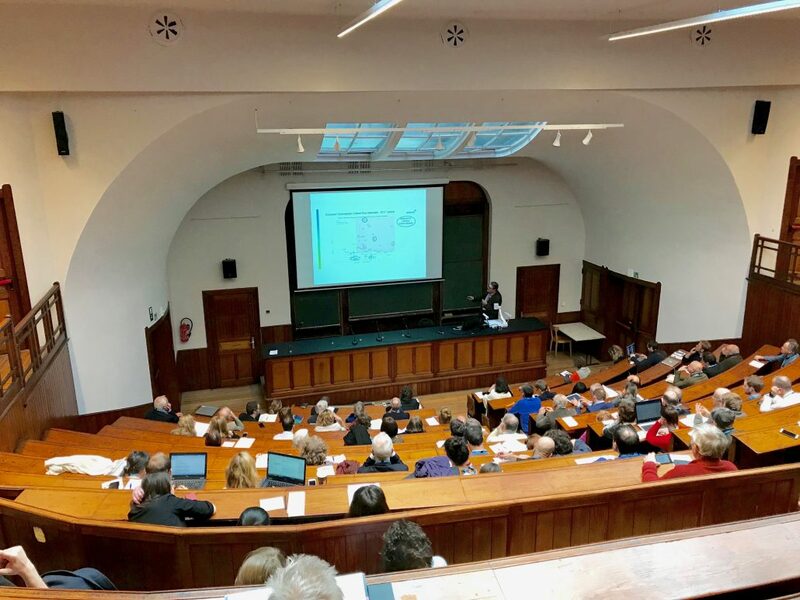 The project’s Final Conference in Brussels (BE) the 27th of February 2018, hosted in the Académie Royale de Bruxelles was co-organised by LPRC. The conference provided an overview of the work and measures developed, gathering feedback on the results obtained and planning for the future, so that the project outcomes -namely the EIGR- can be sustained after the end of KINDRA. 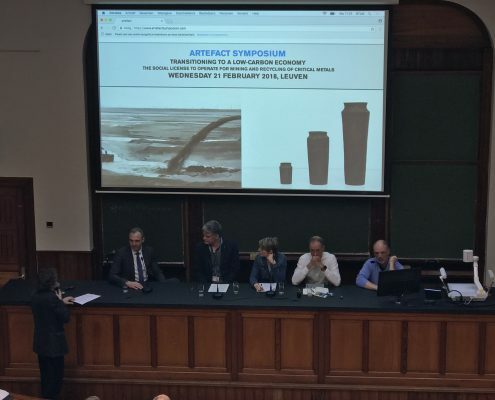 Several member of the European Commission, as well as EASME, the International Association of Hydrogeologists and many more important stakeholders in science, research and groundwater were present and actively involved in Q&A and debates through the conference. 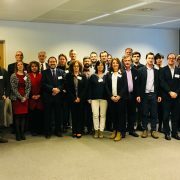 KINDRA Project ran for three years organised by a Consortium of nine partners, twenty linked third parties and ten members of the Joint Panel of Experts, making a total of twenty EU-countries collaborating. 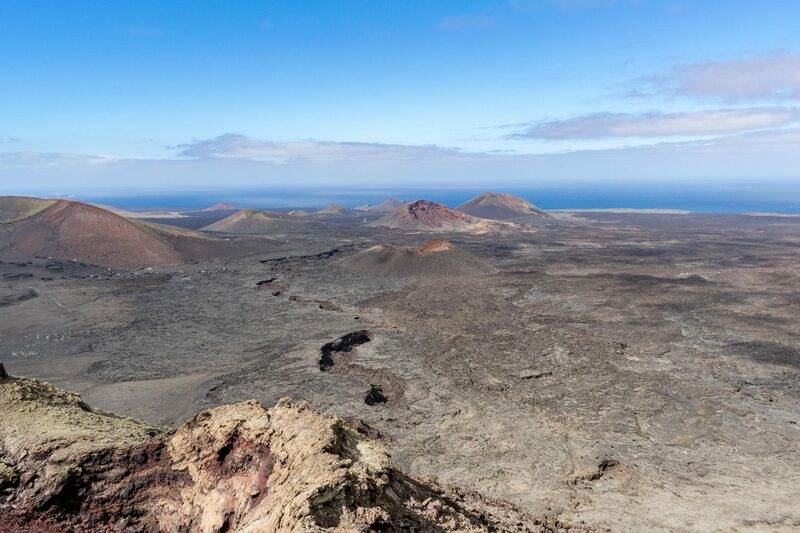 La Palma Research is proud to be part of this very important mission for the future of groundwater research. 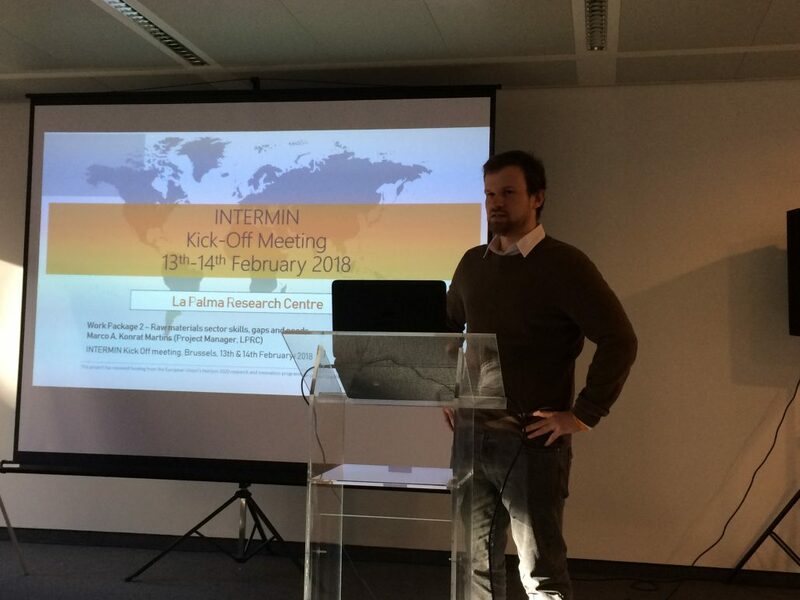 Between the 13th and 15th of February, the INTERMIN (International Network of Raw Materials Training Centres) Consortium and Advisory Board members gathered together in Brussels, Belgium, for the kick-off meeting of INTERMIN – a 36-month H2020 Project aiming at the creation of a self-sustainable long-term lasting international network of training centres for the raw materials sector. For that, scoping and mapping activities will be undertaken internationally, collecting information of relevant raw materials-related skills from training institutions around the globe offering a wide variety of programmes and courses. This will be followed by an assessment of the employers’ needs in terms of skills and knowledge as a means of analysing the existing gaps in the sector. This will be projected into short, medium and long timeframes. Once the gaps are identified and better understood, enhanced approaches and actions will be appraised for responding to these gaps in the sector, creating a new paradigm for international training centres in the raw materials sector. 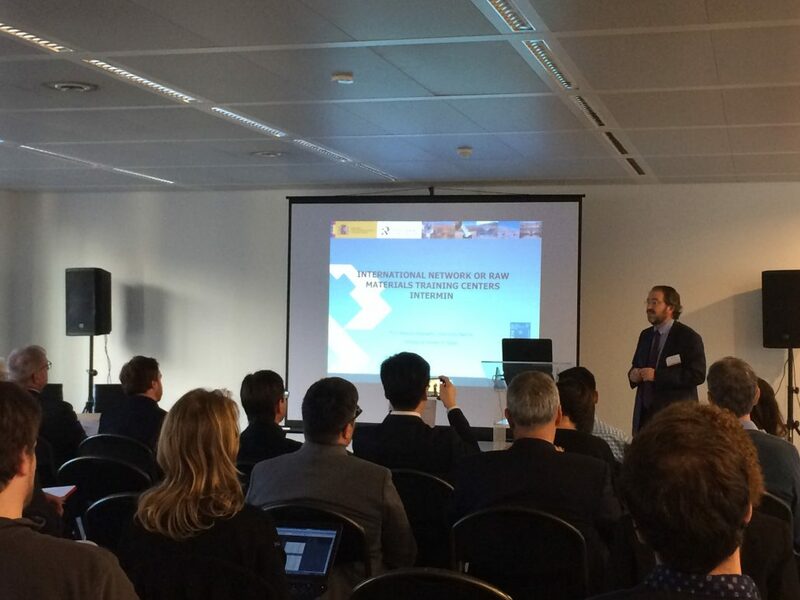 LPRC is leading Work Package 2 (WP2): Raw materials sector skills, gaps and needs. The main tasks will be assessing the employers’ needs and developing a competency model for the raw materials sector. 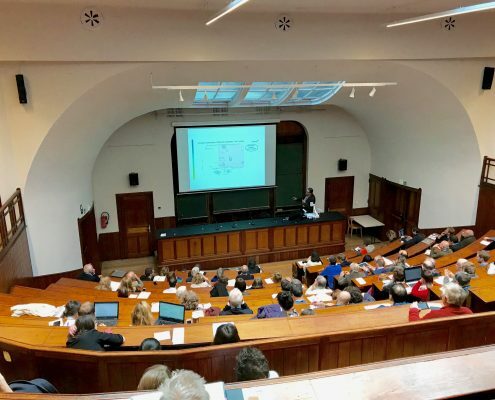 For that, LPRC will work closely with its project partners, particularly the American Geosciences Institute (AGI) and the French Geological Survey (BRGM). 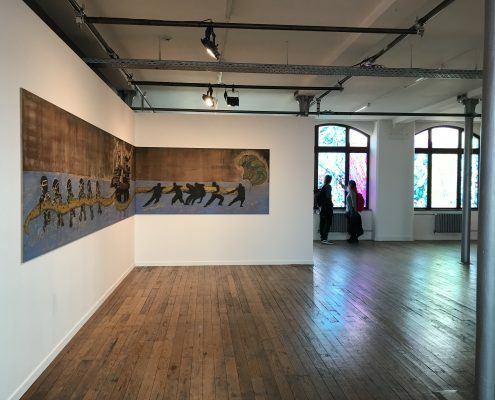 Read more about the project at this summary. The ¡VAMOS! 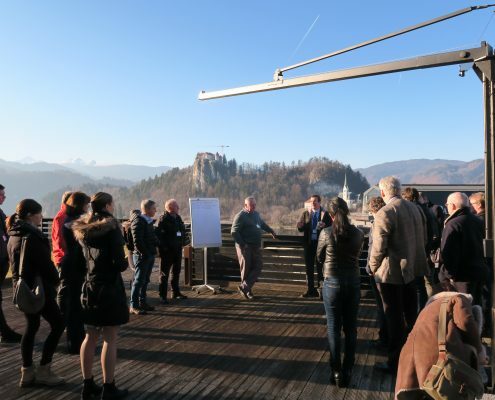 partner forum took place on the 31st of January in Hotel Kompas in Bled, Slovenia. 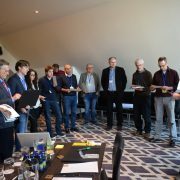 In the morning, the partners discussed the lessons learnt from the first field trials that happened in October in Lee Moor, UK. 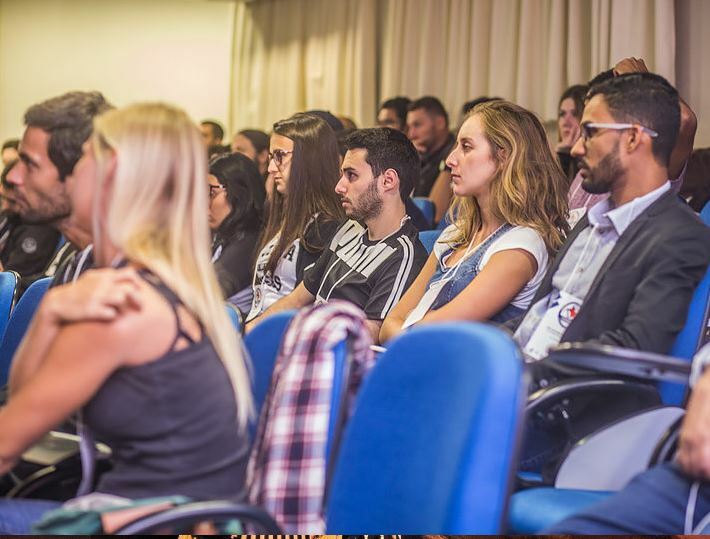 Only a few technical difficulties arose during the trials and most of these were already solved or are in the process of being solved at the moment, in a continuous effort from all the partners. 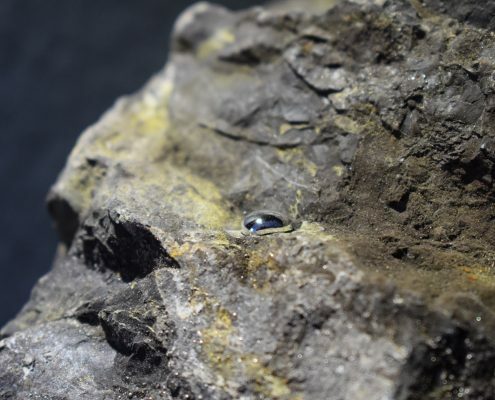 Subsequently the results from the environmental tests were presented, which looked promising, although more data will need to be collected to come to any conclusions. 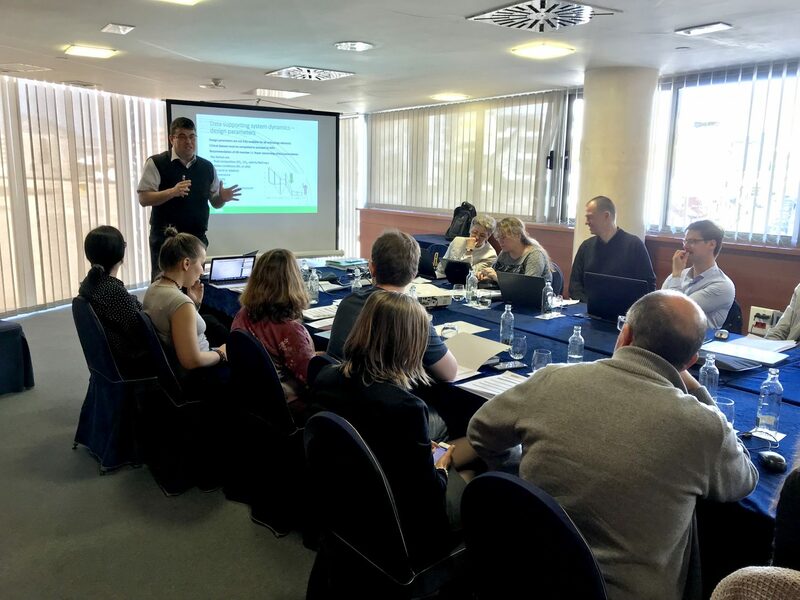 In the afternoon, the discussions mainly focussed on the upcoming work and plans, with the most important topic being the second field trials in Bosnia and Herzegovina in spring. 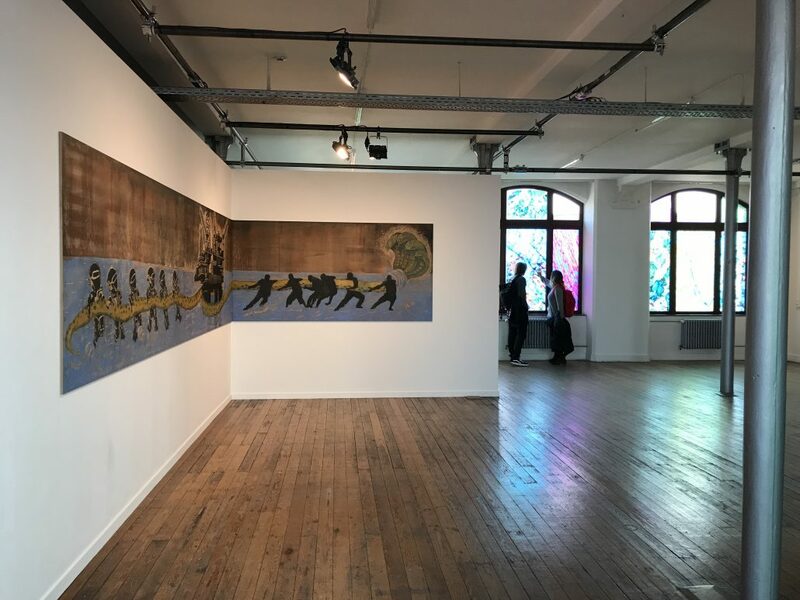 The current focus of the work is on the logistical challenges to be overcome, the preparation of the site, and careful planning and division of the various tasks. 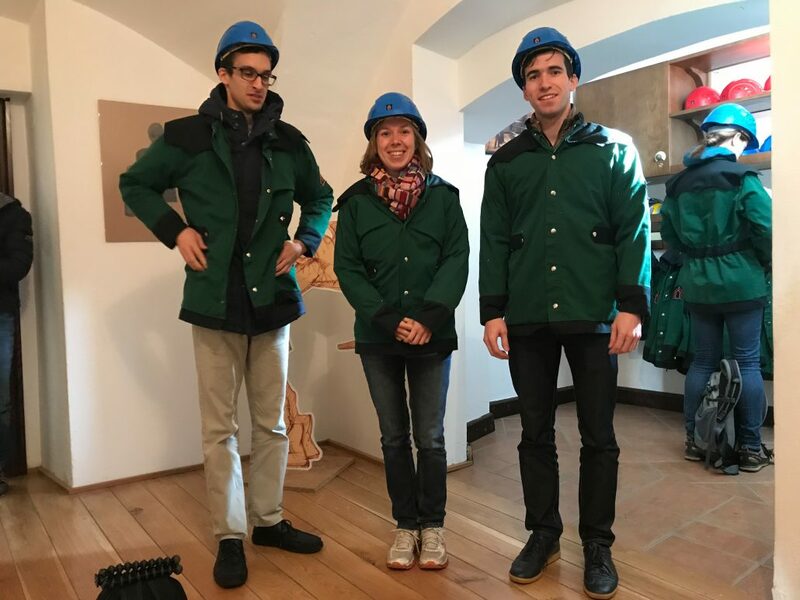 The partners are hopeful of another successful trial! 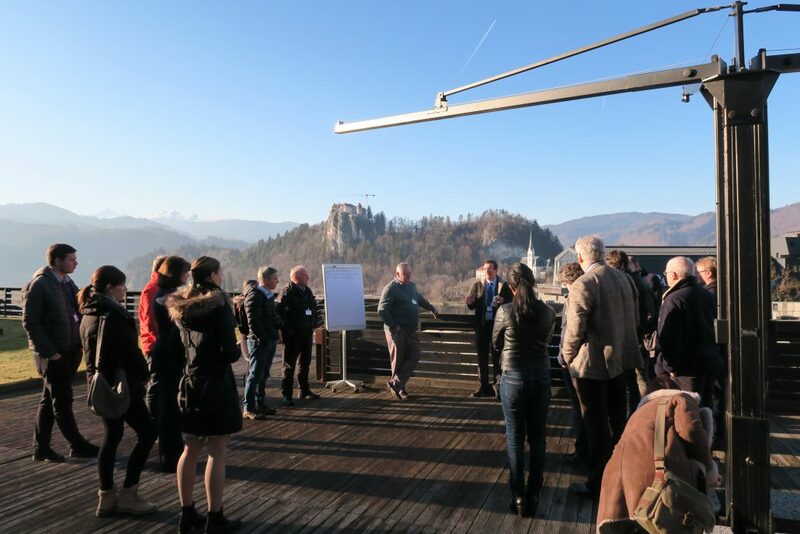 The first UNEXMIN consortium meeting of 2018 took place during the 31st of January and 1st of February in Bled, Slovenia. 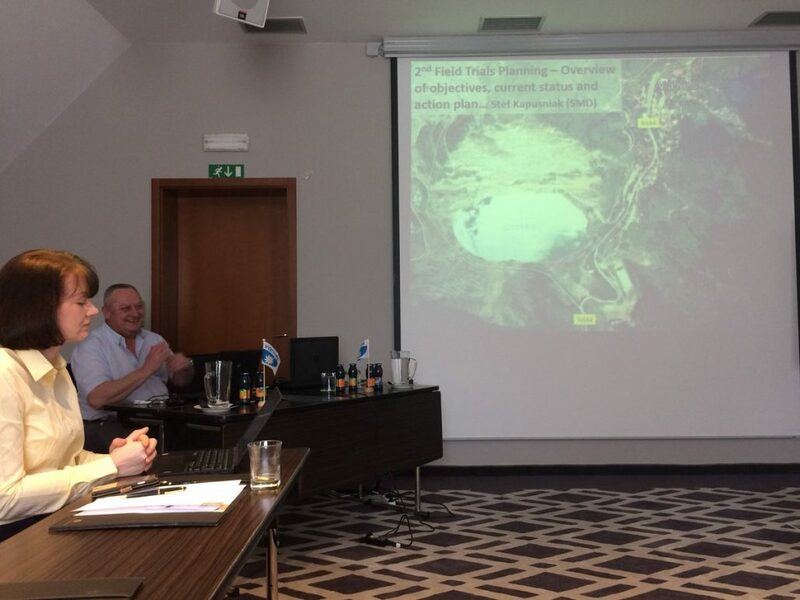 The main points of discussions included the current and future developments of the UX-1 robot and the preparations for the first trial at the Kaatiala mine, Finland, in June. 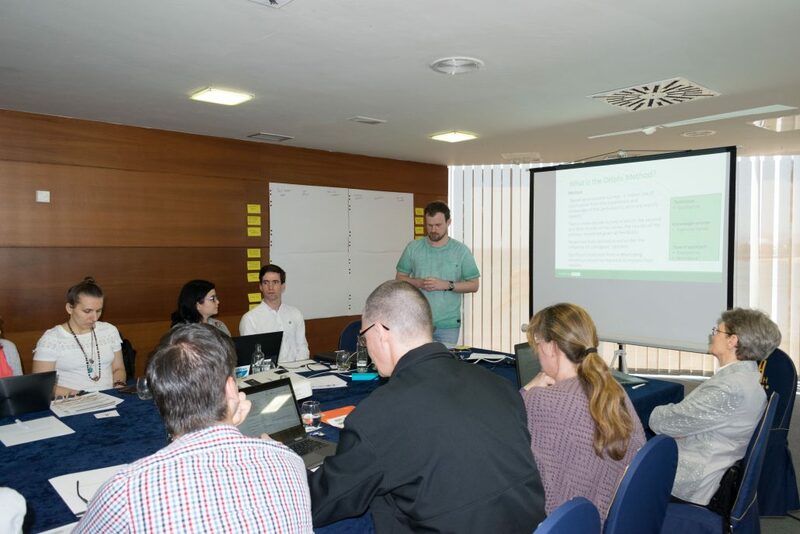 The first meeting day started with a revision and update of the work developed by the project partners. 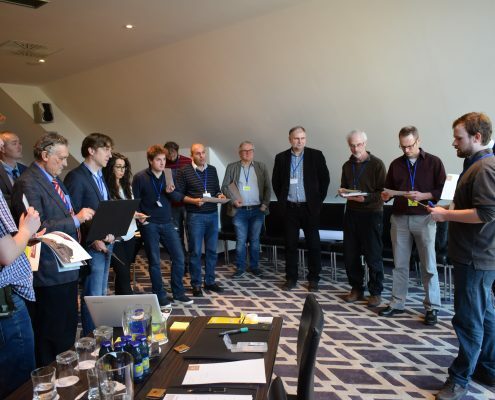 In the afternoon, the UNEXMIN consortium and advisory board members – personnel with useful experience in the fields if robotics and raw materials – were separated into advisory meetings and technical UX-1 discussions. 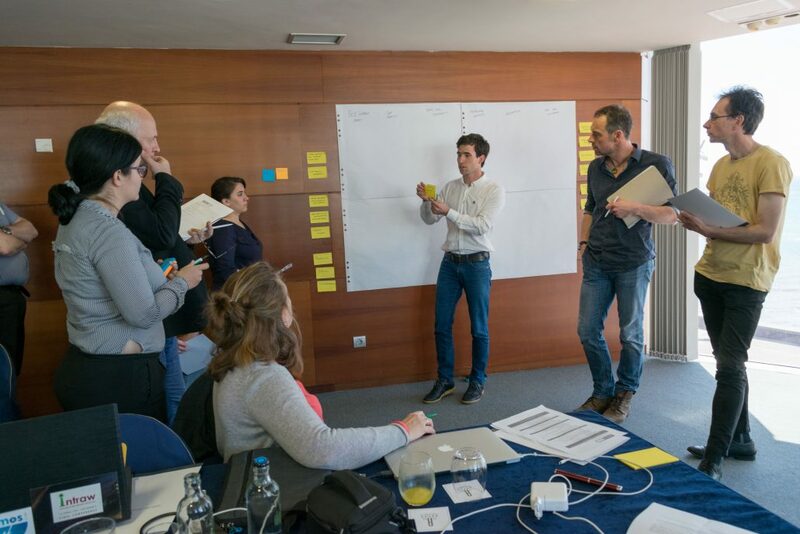 The day ended with the planning for the assembly of the UX-1 robot – to happen in Porto, Portugal, during April. 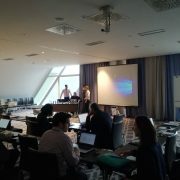 The second day was place to the further technical discussions for the present and future developments of the technology. 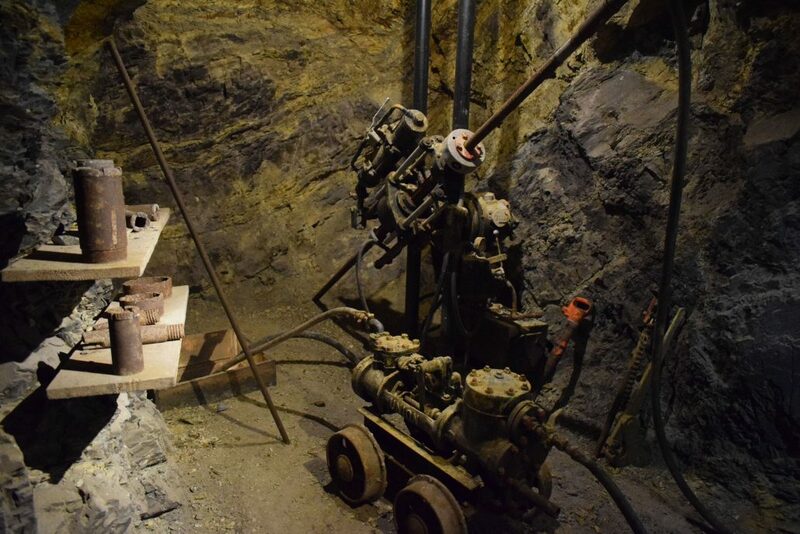 Preparations for the first pilot trial in the Kaatiala mine in Finland were also agreed upon so everything can work properly. 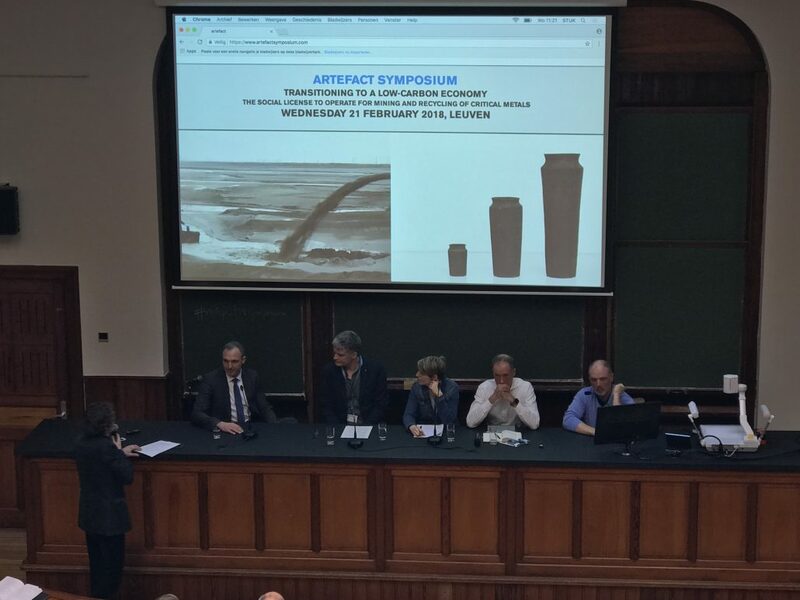 Following, there was a interactive discussion on exploitation measures for the UNEXMIN technology. 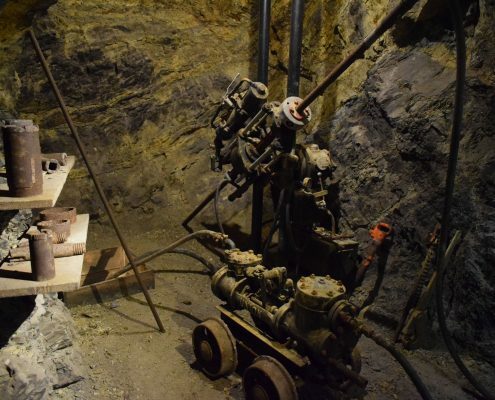 The consortium is working hard to develop the robotic system that will be able to explore and map flooded mines and other underwater environments! 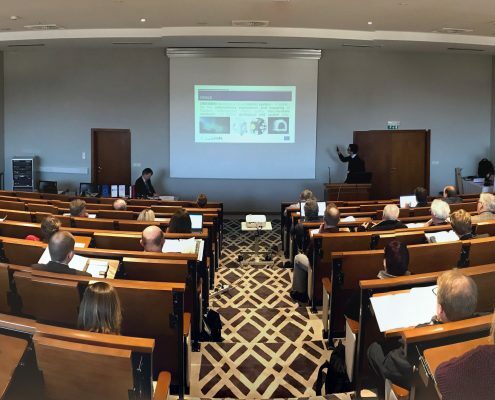 On the January 30, the Hotel Kompas in Bled, Slovenia, hosted the “Use of Robotics and Automation for Mineral Prospecting and Extraction”, a joint conference of UNEXMIN, ¡VAMOS! 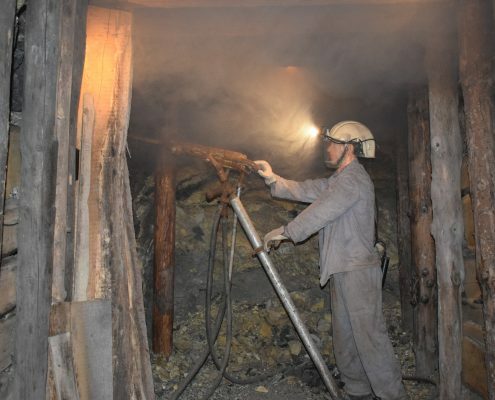 and Real Time Mining Projects. 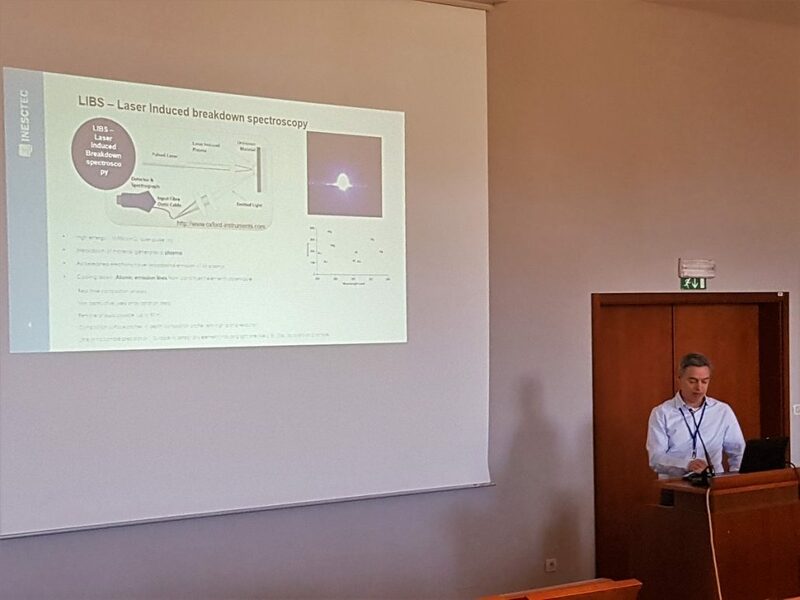 The conference was led by Gorazd Zibret from the Geological Survey of Slovenia. 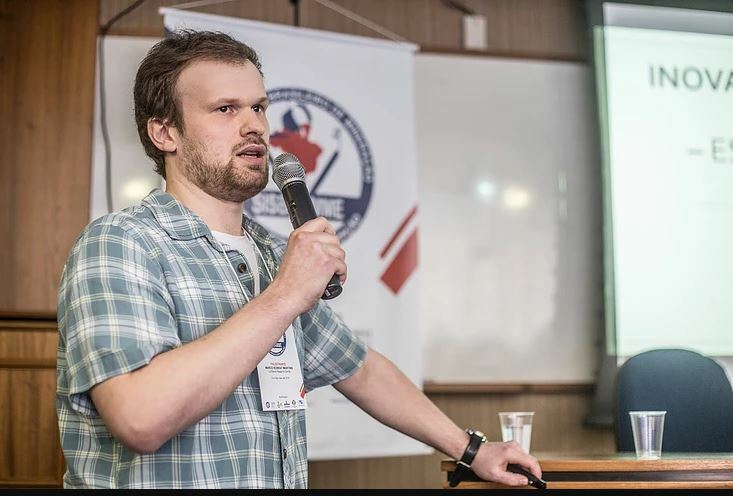 The 1-day conference featured the latest research in a variety of topics related to robotics and automation and their application to exploration and extraction of mineral raw materials. 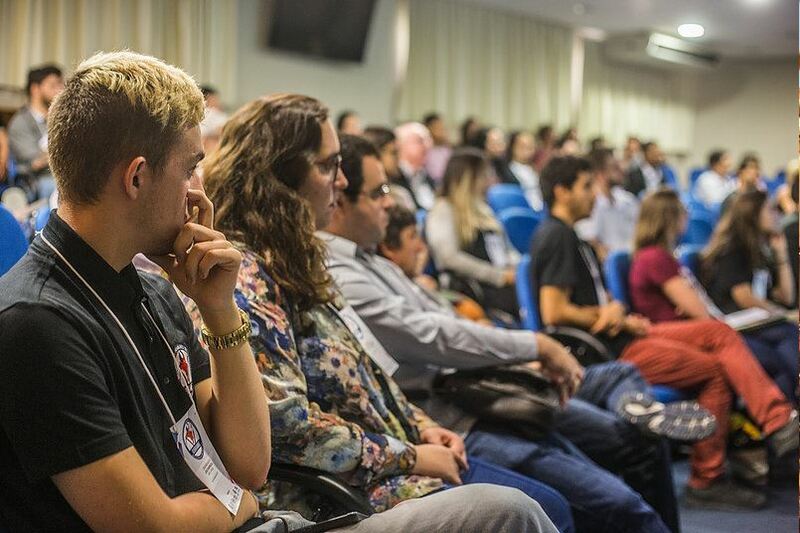 It started with a plenary session featuring presentations such as “Advances in Subsea Mining” (Stef Kapusniak) and “Future Mining: Scenarios and Roadmaps (an international review)” (Marco Konrat Martins, LPRC). 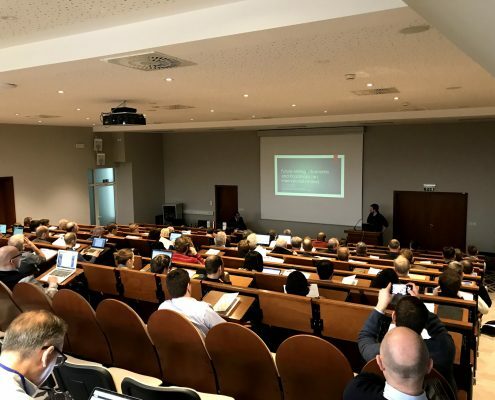 The conference was then divided into two parallel sessions: one related to Hardware developments moderated by Norbert Zajzon (University of Miskolc) and the other related to Software developments moderated by Steve Henley (Resource Computing International). 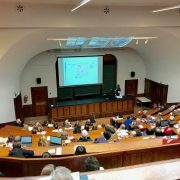 After the lunch break, the conference resumed with a plenary session introducing the leading projects. 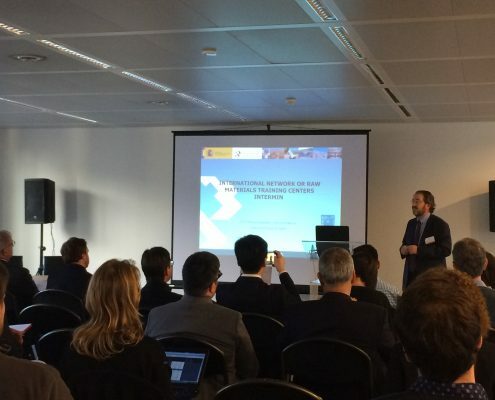 LPRC presented “UNEXMIN project: an underwater explorer for flooded mines” (Luís Lopes). 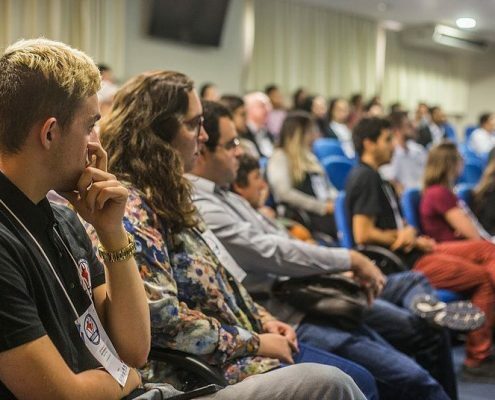 During the afternoon, the participants were divided in two interactive workshops: one dedicated to exploitation of the technologies, the other to future research and technology roadmap planning. On the exploitation workshop participants were called to answer three questions. 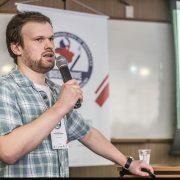 The input will then be used to adapt better exploitation measures for both projects. 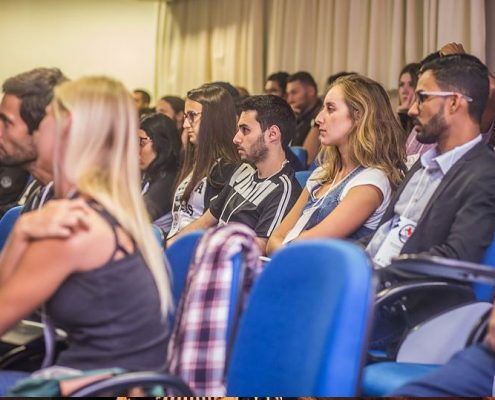 The questions were: (1) What is the best the best exploitation strategy for project participants?, (2) How to persuade customers to buy/invest into new technologies? and, (3) How and where to get additional funds for the projects’ development?. 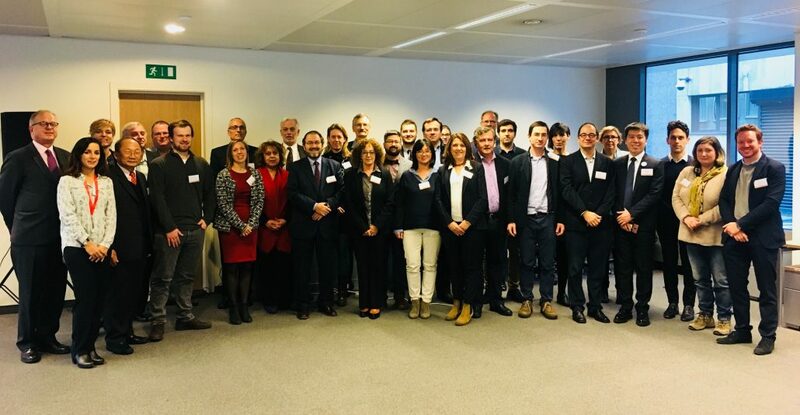 The research roadmap workshop focussed on analysing future scenarios and how the technologies can adapt to specific changes in the raw materials sector. 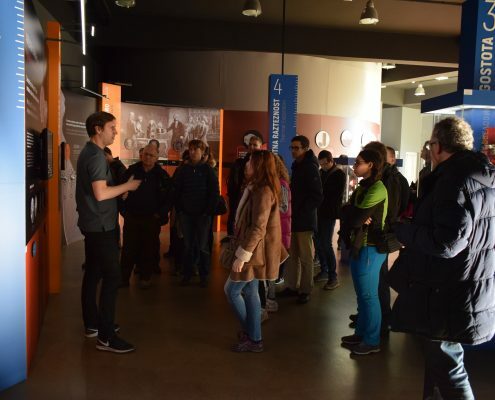 Then, participants helped in the identification of future prospects in three main areas: geological data collection, spatial awareness and navigation, and extraction. The data will be used to define possible research/technology pathways for both projects for the short, medium and long-term future. LPRC team participated at the fieldtrip, previous to UNEXMIN & ¡VAMOS! 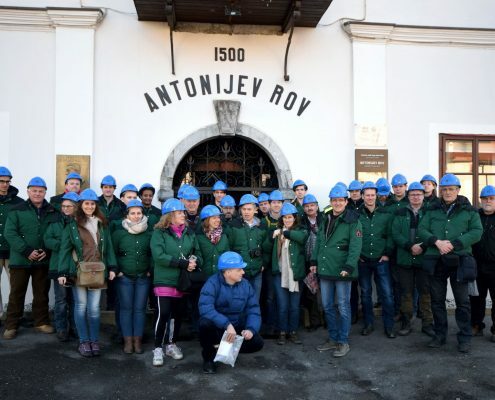 joint conference, to Idrija mercury (Hg) mine, west from Ljubljana. 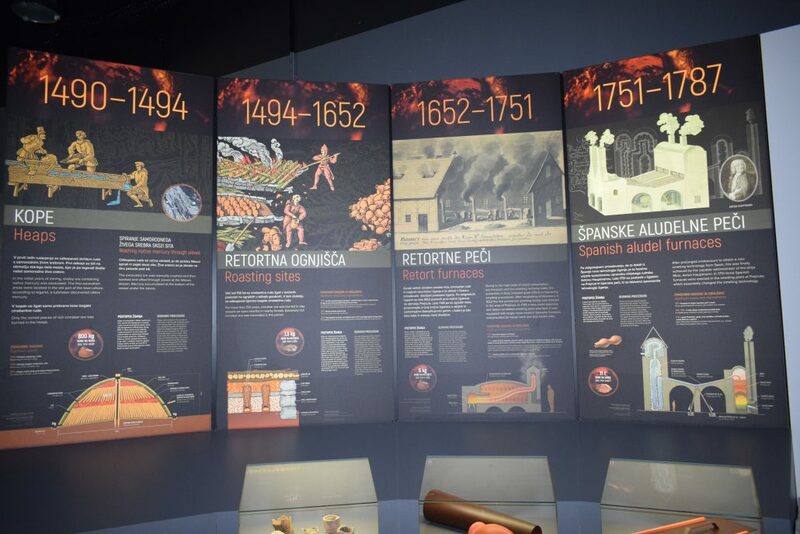 The mercury occurrence was discovered at Idrija in the 15th century, and the mining operation soon followed. 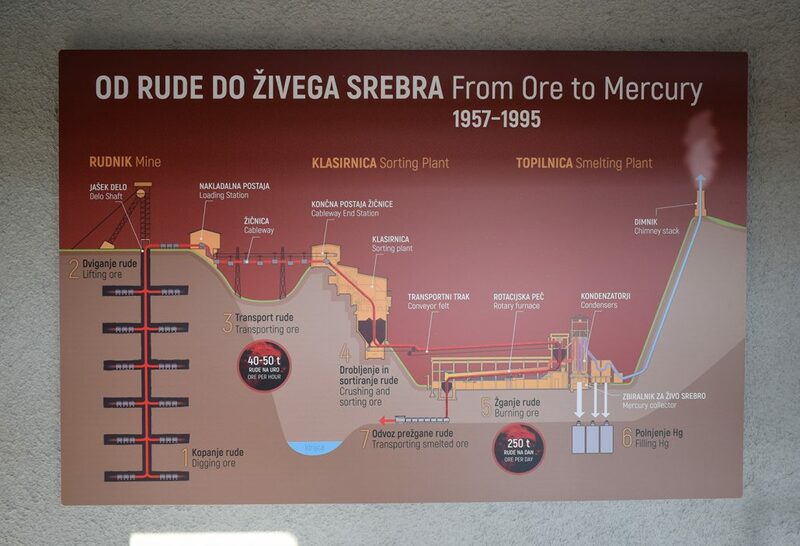 Mercury is present as both liquid metal and cinnabar (HgS) – Idrija has been developed as the second largest Hg mine in the world. 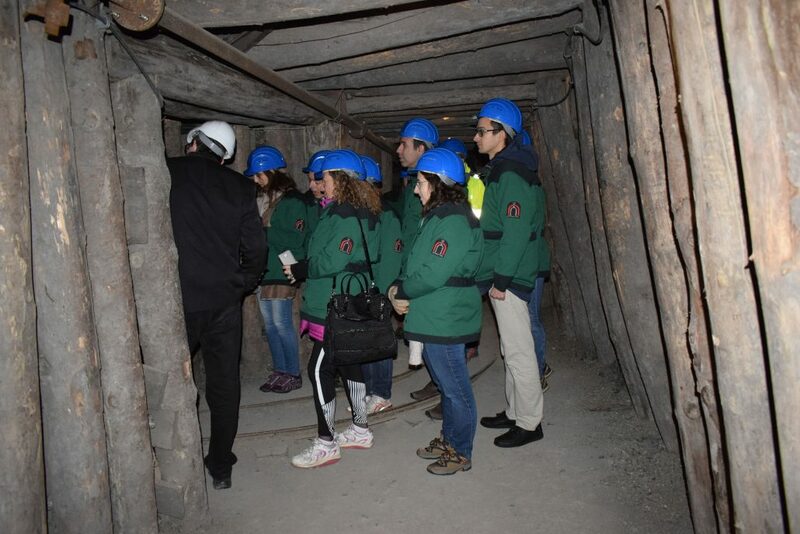 During the last centuries, Idrija’s miners dug over 700 km tunnels, spread across 15 levels down to 380 m depth. 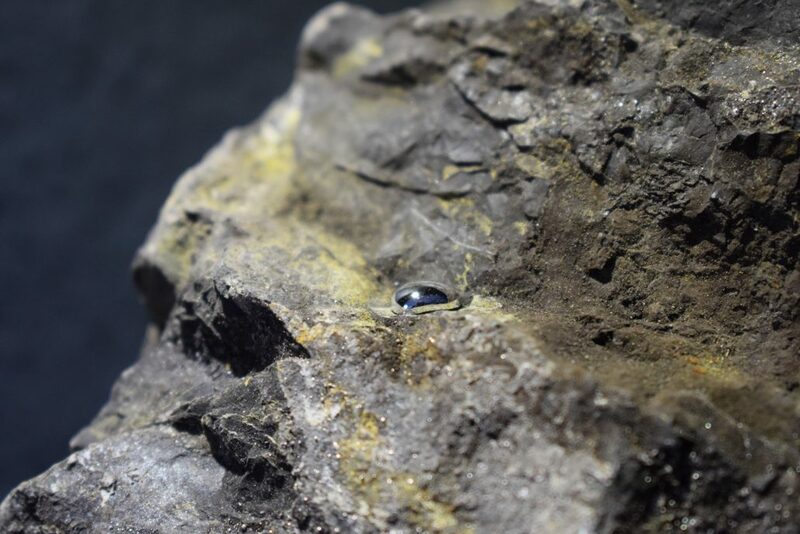 The estimated total production is around 150 thousand tonnes of mercury, that has been used for science, agriculture, extraction of other precious metals, amongst other uses, across Europe and worldwide(1). 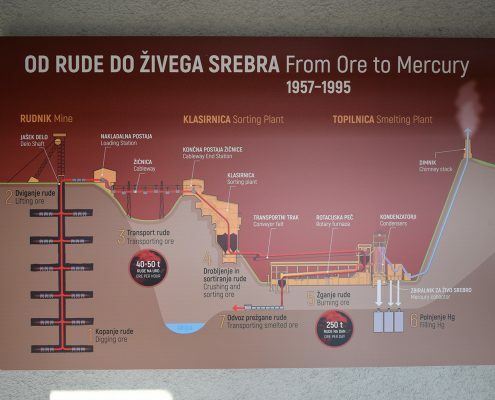 However, Hg mining in Europe has been shut down, together with the Idrija mine, in 1995 due to health and environmental concerns. 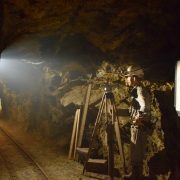 Today the mine and the ore processing facilities are part of the UNESCO World Heritage, showcasing the rich mining history to visitors. 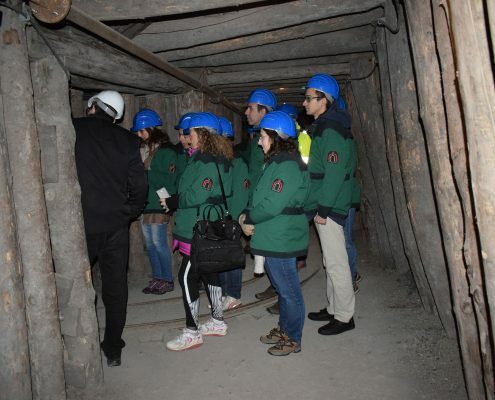 The mine visit showed the technological characteristics of Hg mining at different centuries. 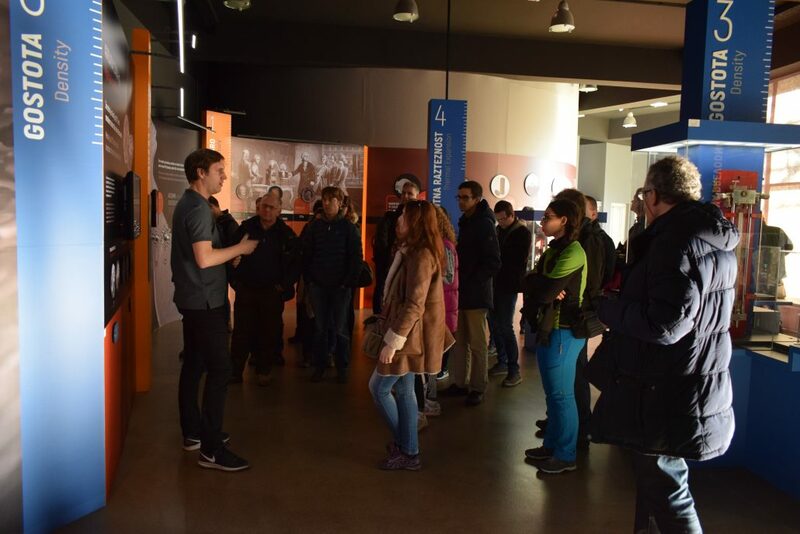 The visitors were also explained about the life of the miners, the role that Hg mining played in the economic, political, cultural aspects of Idrija, and its advantages/disadvantages. 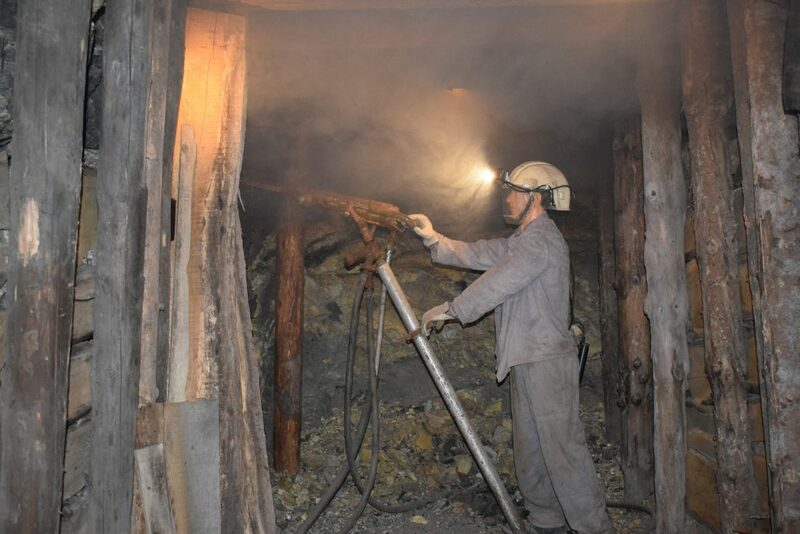 360 degree view in the mine (drag and move the photo to look around). 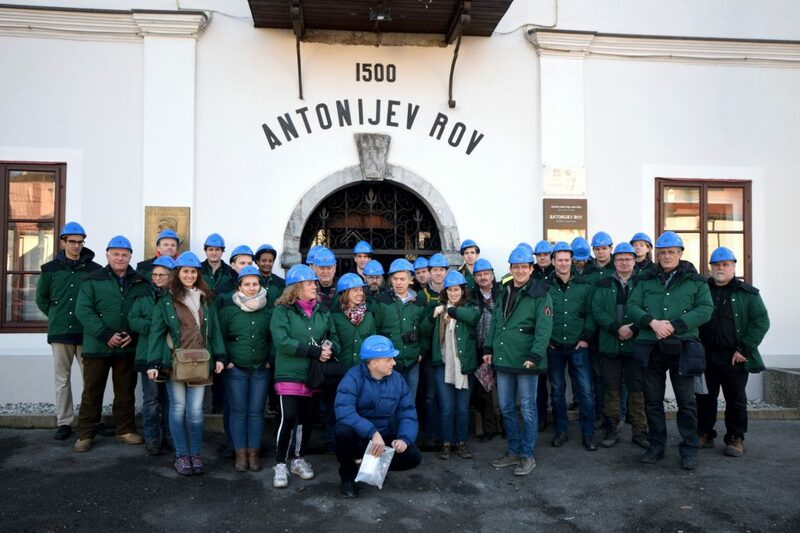 The group next visited the nearby ore processing facilities and the historical exhibition of Idrija Hg mining. 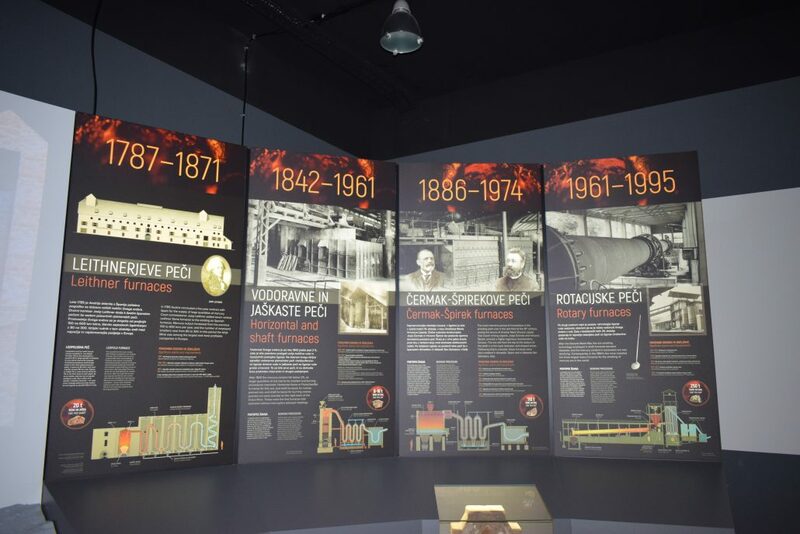 The ore processing facilities went through, at least, 8 major technological upgrade since 1490.